For its fifth edition, the Flatpack Festival conjured up another brilliantly inventive programme that made great use of the art spaces around Digbeth, Birmingham’s former industrial area. The selection included previews of Herzog’s Bad Lieutenant: Port of Call New Orleans, Mamoru Oshii’s latest animé The Sky Crawlers and the provocative Greek psychosexual drama Dogtooth. Live events encompassed everything from magic lantern shows to a plasticine party, which involved adults drunkenly attempting to mould rude/cute/disturbing shapes as the demented strains and visuals of punk combo Jackdaw with Crowbar mounted a double assault against the audience. The Belbury Youth Club, an event curated by the Ghost Box record label, featured rare 70s TV treats, including an MR James story and the exquisitely sinister Penda’s Fen. Music films covered everything from Mogwai in Burning to the Iranian underground scene in No One Knows about Persian Cats. There were also experimental movies by Paul Sharits and Takashi Ito, children’s films, talks, documentaries and archive footage, and an Odeon bus tour through Birmingham. As Flatpack is organised by 7Inch founders Ian Francis and Pip McKnight, it was no surprise to find a treasure trove of short films at the festival. The programmes were curated by Flatpack as well as Glasgow’s The Magic Lantern and the Dublin-based collective Synth Eastwood. The Magic Lantern’s programme was entitled ‘Pandemic’ and, although the films covered a variety of topics, the two best shorts in the selection were the ones that actually dealt with apocalyptic scenarios. Javier Chillon’s Die Schneider Krankheit presented itself as a newsreel recounting the rapid spread of a deadly virus after a spaceship containing a chimpanzee crashes in West Germany. The 50s newsreel style was perfectly reproduced, while the reasonable tone of the reporter was brilliantly contrasted with the outlandish events depicted, including the creation of a tortoise/leech hybrid to cure patients. The zombie movie was given a comic and very British twist in Louis Paxton’s Choreomania, in which a man on his way to work tries to escape the dancing plague that has turned everyone in town into twitchy ravers. Synth Eastwood brought ‘Darklight’, a selection of animation shorts that opened with Aaron Hughes’s Backwards, which told a failed love story from the tragic end to the unexpected beginning, with several comic twists along the way. Mike Weiss’s Debt was an excellent puppet animation in which a little boy becomes obsessed with collecting pennies, but soon finds out that the luck they are meant to bring is not without consequences. It had a whiff of Eastern European strangeness; the boy was both cute and creepy with his big button eyes and bowl haircut, and the story was original and well-paced. Croatian filmmaker Veljko Popovic created a striking dystopian world in the enigmatically titled She Who Measures. A column of identical big-headed men and women pushing trolleys are led across a barren moonscape by a clown, brainwashed by smiley screens attached directly to their faces. They march to the sound of a supermarket radio, putting any rubbish they encounter in the trolleys. A man who is not wearing a mask tries to encourage them to get rid of the screens but fails to stop the column of slave shoppers. The atmosphere was very dark, the vision pessimistic, the ending mysterious and the animation bleak and powerful. Among the shorts selected by Flatpack, Andersen M Studio’s Going West was a great short film that made the story of a book come alive as it was narrated, animating its very pages to create all sorts of shapes, including houses and tunnels. The selection also included two interesting animated documentaries. David Quinn’s Twas a Terrible Hard Work used black and white animation to illustrate the experiences of a group of miners. The combination of factual realism and imaginary reconstruction was a great way to deal with the subject matter and the film was a very poignant evocation of life in the mines. Samantha Moore’s An Eyeful of Sound was less successful. The idea of conjuring up the perceptions of three women who experience synaesthesia through colours and shapes was excellent, but the realisation was not entirely satisfying: the animation was not very inventive and the narration provided by the women was edited in an unnecessarily repetitive way. The final short treat of the festival was screened before Tomm Moore’s animated Irish children’s story The Secret of Kells on the last day of Flatpack. The Brothers McLeod were there to present their latest film, The Moonbird, which marks a departure from their previous work. 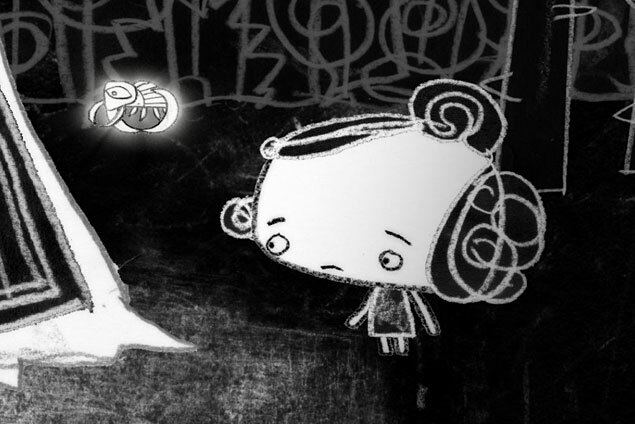 A dark animated fairy tale in black and white, it told the story of a little girl who is kidnapped by a witch who wants her tears for a magic potion. The animation looks like chalk on a blackboard, the atmosphere is perfectly sinister, the story involves death, dismemberment and various transformations that culminate in a fight between two quasi-mythical birds, one white, the other black. Watching it felt like doors were being opened into strange and wonderful worlds, something that can be said of the Flatpack Festival itself.